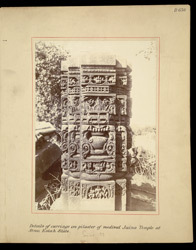 Photograph of carvings on a pilaster of the mediaeval Jaina temple at Atru in Kotah, Rajasthan, taken by an unknown photographer for the Archaeological Survey of India Collections: Northern Circle (North-Western Provinces and Oudh) in 1896-97. In the Progress Report for that year, A. Führer wrote, "About 22 miles south of Bilas lies Atru-Ganeshganj in Nizamat Kunjer, possessing the ruins of a large beautiful Jaina temple, built by Maharajadhiraja Jayasimha in Samvata 1319, as recorded on a pilaster close to the portico". The pillar in this view is elaborately carved with kirttimukhas, medallions with miniature figures, pots with overflowing foliage, scrollwork and jewelled motifs.